This article was reposted from USA Today. For more information on the Barr nomination from ACS, visit our resource page. As William Barr's confirmation hearings for attorney general begin, the question on everyone's mind is: Will he protect the Mueller investigation? What is a president to do when a federal criminal investigation is closing in around him? Put some friendly faces in charge. Out with Attorney General and Deputy Attorney General Jeff Sessions and Rod Rosenstein, in with Acting Attorney General Matthew Whitaker and attorney general nominee William Barr. Sessions famously incurred President Donald Trump’s wrath because he wouldn’t shield him against charges that the Trump campaign conspired with Russian officials to sway the 2016 elections. Rosenstein, similarly, irked the president by steadfastly protecting special counsel Robert Mueller's investigation. Both men may have technically resigned, but it's the worst kept secret in Washington that their stands on the Russia investigation cost them their jobs. 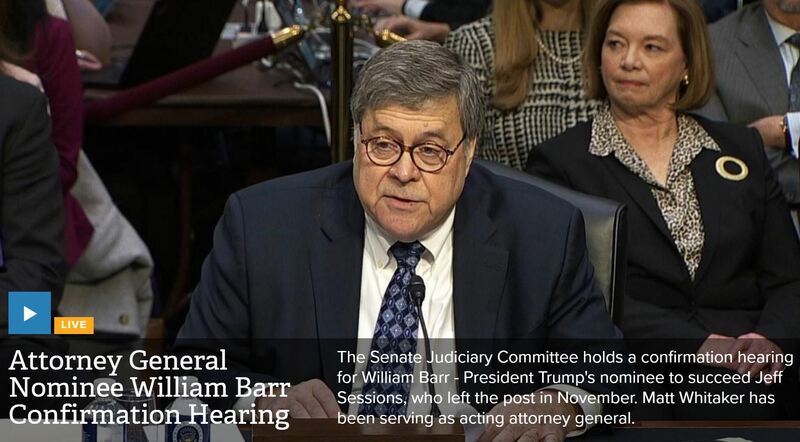 Trump replaced Sessions with Whitaker as acting attorney general and nominated Barr to serve in the position full-time. Confirmation hearings begin Tuesday. Given the legal shroud hanging over this presidency — and the fate of those previously tasked with overseeing investigations into Trump’s conduct — it is vital that the Senate receive clear assurances from Barr that, if confirmed, he will remain independent of the president and allow the Mueller investigation to continue unimpeded. Barr has in the past downplayed the allegations made against the president and his campaign. And even though the Trump has said several times that the Russia investigation influenced him when he fired the man originally overseeing it, James Comey, Barr has said that the president made the right call. Barr has also shown himself to be no friend of special counsel appointees from years past. He is alleged to have undermined the special counsel investigating the Iran-Contra affair, urging then-President George H.W. Bush to pardon several figuresinvolved even as the investigation was progressing. Trump and Barr are even said to have discussed the possibility of Barr serving as Trump's private defense attorney. That didn't happen, but it does provide a window into how useful Trump thought Barr might be with regard to the Russia investigation. Trump is in legal jeopardy on many fronts. Several of his campaign cohorts are either in jail, have pleaded guilty or have been indicted. He is circling the wagons and obviously views the U.S. attorney general's office as a get-out-of-jail-free card. How will Barr impartially oversee Robert Mueller’s work? Will he commit to making Mueller's findings public? Will he resign if Trump demands he fire Mueller? Does Barr think presidential documents can be subpoenaed as the courts found in U.S. v. Nixon? The American people deserve an attorney general who will uphold the rule of law and put their interests first. Any failure by Barr to clearly address any of the questions above should disqualify him from serving as the highest law enforcement officer in the land.